Student Senate focused its meeting on internal elections. Senate had to vote from a large range of competitive applicants across four different positions: freshman representative, off-campus representative, on-campus representative and at-large representative. There were 12 applicants and only eight positions. In the freshman representative elections, there were two positions and the candidates included Kramer, Milliner, Penagaly, Vagias and Roberts. The focus of topic came mostly down to schedule conflicts and time management. After questioning and debate, the majority of Senate elected Milliner and Roberts on the second round of voting. In the off-campus representative elections, there were two positions and the candidates were Porter, Curtis and Perry. The debate was centralized on how much involvement is considered too much involvement. Many of the candidates were involved, including Curtis who cited various leadership positions and organizations that she is in. 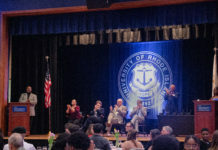 Several senators defended Curtis, explaining that a lot of involvement is good for Senate and pointing out a new organization that she is apart of, Bridges, which is a club designed to sit down people from all the organizations to discuss problems at the University of Rhode Island. However, in the end, Senate decided Curtis’ schedule may not of been ready enough for Senate and the majority elected Porter and Perry. In the on-campus representative elections, there was one position and the candidates were Speckmann, Pellagaly, Percy, Hallam and Kramer. The center of focus was mostly on interest and passion for senate and longevity. Senate felt it was important to bring in someone who was going to be able to stay with Senate for a longer period of time. The main field of candidates was between Speckmann, who unsuccessfully ran in the freshman elections as freshman representative, Percy, a junior resident advisor and orientation leader, and Hallam, a freshman running for the first time. Ultimately Senate voted in favor of Speckmann to be the on-campus representative. The last main candidate, Percy, was focused less on cultural diversity but more on diversity within various groups and experiences. Percy was described by one senator as being “diverse in mindset.” Percy was also described as having “the drive…and I see him being the future of Senate,” by senator Anderson, as well as “the conversationalist we’re missing on the floor.” In the end, Senate majority voted Kamara and Percy to be the at-large representatives. Nicholas Bush is the Web Editor for the Good Five Cent Cigar and a Junior Psychology major at URI. When he's not writing, he's working on various activism projects from mental health to nonviolence to climate change.